I can't believe we've been in Minneapolis for over a year & have never gone out for the local hamburger favorite, the Juicy Lucy (or Jucy Lucy). Never heard of a Juicy Lucy? It's a 1/2 pound burger stuffed with cheese, usually American (though depending where you are you can get other cheeses including Bleu Cheese), that is cooked until the the cheese become a molten core. They warn you when taking your first bite you can really get burned by one of these. Two places in Minneapolis claim to be the original home of the Juicy Lucy, The 5-8 Club & Matt's Bar & people hotly debate who has the best. Since we were near the 5-8 that's where we ended up for lunch yesterday for our first Juicy Lucys. Let me tell you this place does one good burger. The Juicy Lucy is a little crunchier on the outside than a regular burger because of the longer amount of time it spends on the griddle. We loved their wonderful soft buns as well. This week's cupcake will be Vanilla Cherry. Looks like you will be eating good this week! Nice menu! If you don't have plans for the sunchokes yet I recommend roasting them like yams, just rolled in oil and salt and cooked until the insides turn into mush. Like yams they split and the mush that leaks out caramelizes fabulously. The comparison hadn't occurred to me, but it does taste a bit like maduros now that you mention it. 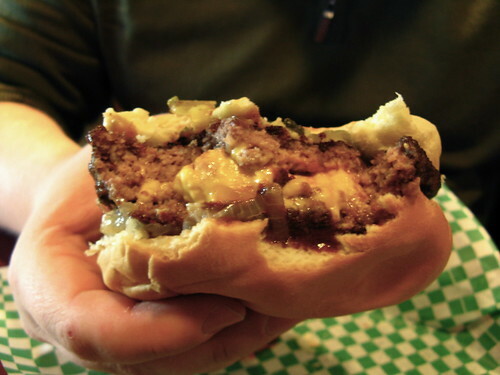 Oh man - I can't believe I have never even heard of a Juicy Lucy! It looks like burger heaven! I would roadtrip to Minneapolis for one of those burgers!! 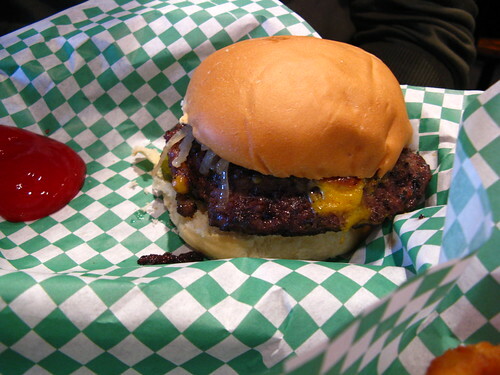 what a name, jucy lucy. I can seriously taste that from your picture. I am suppose to be going with a friend of mine to a place here that has kobe beef. I want to try it and then I dont know if it is worth it for me, calorie wise and budget wise. By the way-- we did make it to Hell's Kitchen while we were out over Christmas and it was great. We went for breakfast and I would highly recommend it-- interesting atmosphere and great food at a really reasonable price. That burger is making me drool. That burger looks down right deadly.